Close to major manufacturers, dealers & service centers. Visit Shipshewana Flea Market, Amish Acres and Notre Dame nearby. Stay in our pull-thru, level RV sites or our rustic to fully furnished, air conditioned rental cabins. We stayed for a few days on our way through the area in a 50 amp FHU site for $43/night with GS discount & tax. 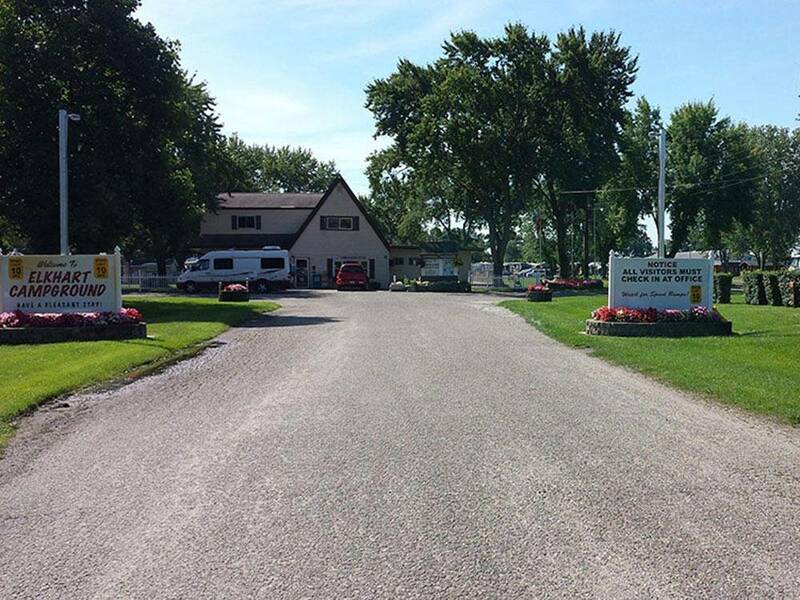 It is a large campground with wide, easy-to-maneuver roads, and long pull-through sites to handle big rigs. Our pull-through site was plenty long enough for our 40 ft 5th wheel and truck. Wifi was good. The pool was closed for the season but looked clean and well-kept, as were the grounds and campsites. Staff were all friendly and helpful. We would return if in the area again. Nice enough place. Spent two nights there. Sites seem a little tight. There is a nice walking/bike trail in the wooded area at the back of the property that is well kept and nice to ride bikes through. Didn't use restrooms so cant really comment on those. Seemed like plenty of full timers there. Good location to visit the RVMH museum and hall of fame and the RV manufacturing plants. Friendly owners and staff. Hookups are well-placed, pull thru sites are long and level (crushed asphalt). Water pressure is good at 60 psi. Most sites are somewhat tight next to each other. Wi-Fi is far. It's a very quiet campground. We did not enter or use the restrooms. We stayed for 3 nights. Overall was a good stay and will stay there again. 2017 Fleetwood Jamboree 31U class C with toad. What a lovely campground run by delightful hosts. They could not have been any nicer! I'll stop there again whenever I pass through that way! Thank you for your hospitality & beautiful park. It shows in every aspect (down to the welcome sign, beautiful flowers & manicured lawns,) that you truly CARE!!! We like to stay on a full hookup campground before we head home to MI after spending the winter in warmer weather. We were able to dump and flush our tanks here. We winterize at this time as our 5th Wheel goes into storage for next winter. This campground had good water pressure. There is lots of grass, which we had not seen for months in the southwest. We left our antena up, and as we drove out the owner dashed out and reminded us the antena was up, observant individual! Considering there are two campgrounds here, this and the fairgrounds, this by far is better. We had reservations to the campgrounds and when we got there it was jam packed spots in a field. Not much more to come here so we left. There are sites that are crammed together, and also some that have more room to breath towards the back. HUGE dog park. Great big laundry room. There was a religious group from India having some kind of party every night all week so the smell of curry and the colorful dresses were in display. The water was so full of iron it stained our bathtub and all of the connections (basically anywhere that the water touched) turned rusty colored after the 1.5 weeks we were there. The park was clean although there were a lot of run down RVs plus really nice ones, a mixture. A few dogs running loose. The owner seemed to patrol several times a day. Verizon cell was great! The grounds were well maintained and overall was a pleasant place to stay. We only stayed the night so can't vouge for facilities or restrooms. The price was fair. My only complaint was the last row is grass not really a road and was a little confusing at first glance. Good people, good WiFi, easy to maneuver. Bathrooms excellent, clean manicured grounds. Close to everything. Top shelf RV park. Stayed here one night. Off the beaten path but a lovely campground. Very green and spacious. Have to ask for cable which I was not told but only here for one night. Huge dog run -- one of best we have encountered in our travels. The owner was friendly but complained to us about another customer. The road in is easy to navigate, some of the turns in the park are very tight. It is right off of I-80 so convenient for overnight stays, and set back far enough that the noise wasn't too bad. Very large park, well maintained. Sites are extremely close together, our living room slide almost hit our neighbors picnic table. When we first pulled in we couldn't find the sewer hook-up and the cap was missing. The placement of the sewer hook-up is a good 10 feet from the electric hook-up. Sites are grass which was very long, and not very level, but long enough for our 37-foot RV, tow dolly and parking. No WiFi. Verizon signal was good. There is a playground, pool, mini-golf, basketball area, and horseshoes, some of it looked a little worn. The best part of the stay was the very large fenced in dog park. We stayed one night, August 4, 2016 and paid $41.41 with our Good Sam Discount. Stayed here 8/6/16. The park was nice looking and appealing...online. Once we arrived, we found ongoing construction and the campground roadways in poor condition and dusty. The playground was not available. After a day of travel to arrive there, we found the shower/bath facilities less than appealing. They had a musty odor, cheap flimsy dirty shower curtain and the shower wall dividers were less than ideal and lack of lighting made them dark. This campground was one of 9 campgrounds on a 17 day road trip. Many other campground's had superb shower facilities that rated a Good Sam 9 or 9.5 and were far better then this campground by a long shot. I would give this CG a 8/8/7 on the Good Sam scale. Stayed here for one night on the way through to Wisconsin from NJ. Site seemed pretty level and the space was acceptable. The roads were not in great condition and mostly dead grass. The owner seemed nice. The camp store was not stocked at all. Not even basics like butter. For an overnight stay, it was fine, but I would not spend more than a night or two if I had to. grassy parking areas. some shaded areas. bathing facilities needed a good cleaning. Stayed in 171 which is a pull thru with w,s,e (50). Level, but the site had dead grass all over it, therefore mud! Huge pet fenced area. But it needs mowing and some care for the weeds. It seems that upkeep of the roads and sites are minimal. But it was quiet and close to the factories that we came here for. All grass site kept dust down. Friendly responsive staff. Stayed here before and very convenient when working with RV Service shops. Not great. They're just doing the bare minimum here to provide basic services. The Good Sam ratings are a joke, and after a month of full-timing, starting to realize they don't always match what you get. This got a 10 for restrooms. They were clean, but didn't even have shower soap shelves, and there are only 2 shower rooms for a very large area. Tennis court is super old and unusable except for little kids. Highway noise from I-80 is constant and not super loud, but noticeable.